redtagcamera has no other items for sale. 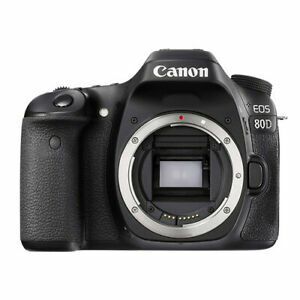 Expand your photography horizons with the Canon EOS 80D digital SLR camera. Delivering pro-level image quality, this camera helps you achieve razor-sharp details and stunning effects to make the most of your subject. Equipped with a 24.2 megapixels CMOS Sensor the camera is able to create pictures with a resolution of up to 6000 x 4000. The DIGIC 6 image processor ensures a high quality of your images. A big range of features and effects make photos look professional. Te ultra-detailed RAW output capability makes it very easy to balance exposure, saturation, and contrast for amazing pictures every time. If you want to capture moving images, this camera shoots videos in full HD and 24 fps for clear results. The camera also features built-in Wi-Fi for easy transfer and sharing of images. Great camera, great price and fast delivery! Really fast delivery, works beautifully, great price. Thank you so much! Perfect transaction and quick shipping! As described. Thank you. I have used the Canon 20D, 50D, and now the 80D. Couldn’t be happier. At first, the folding, rotating, touchscreen menu was a bit strange and seemed gimmicky, but the menu system is intuitive and the rotating screen may come in handy at some point. My only concern is the screen itself, as I tend to not be gentle on cameras during hikes, etc. Some of my old lenses have new life now, with the higher available ISO allowing more light in at acceptable noise levels, so low-light shots look nice. Fast autofocus is such a relief as my dying 50D was never too good at it. A variety of added features such as presets, HDR, and artistic effects probably aren’t necessary, by will be fun to try out. The wireless is a bit clunky to set up (a few sub menus to navigate) but not too bad for getting images straight to my iPhone. Overall, this is my new favorite camera! Wanted to upgrade my Canon 5ti. I wanted to get a camera that would take me to the next level. Take some punishment , a little mixture, as I loved to take pictures out in the field, in vacation. In extreme conditions. This camera has those features, plus. The price was great, solid camera, and all the lenses I bought for the 5ti, work on the Canon 80d. Winning!! !😎 Love the 80d, love the smaller format. Shipped as promised, and quickly. Built on the same frame as the 70d, not much difference there... I sold my 70d so I could purchase the 80d... the biggest difference is the megapixels, 24.2MP compared to the 20MP on the 70d, and the 45-point cross type af system, compared to 19 point... so I can tell a difference in the autofocus, very quick, and picture quality is a little better...also 7 frames per second, a little better than the 70d in which was I believe 5 frames per second.... I am using my same lenses.... the sigma 18-35mm art lens is the best... great image and video quality... would be nice if this had 4k image quality, but this works well, I would recommend. The improved CMOS processor with greatly extended ISO sold me on wanting to get this camera. If you’re familiar with other Canon DLSRs, it’s a snap to figure out how to use it. There are minor differences - power switch has moved, different battery and memory card form factor, so you have to replace all of your old gear if you’re migrating from a Canon 50D like me. But it’s worth it. They dynamic ISO setting in manual mode is just amazing. Way more flexibility in low light. Highly recommended. I have added this body to my camera bodies, as a newest and fastest shooting body. But what I wanted most, it was Wi-Fi and NFC ability. That is a AMAZING feature in the DSLR cameras. 24 MP and 7 frames per second is impress. The best is dual AF in this body, super fast and super accurate. With my lenses this is very good choice for any kind of photography. Even it is a crop sensor, still best camera I ever own. This is cheaper version of high end Canon's bodies. Highly recommend this camera. It is worth the money.